Local press has confirmed the arrival of the second Sikorsky S92 at Newquay, ready for the new SAR base to open under the operation of Bristow Helicopters. As the UK SAR provision transitions from a mixture of civil and military over to a single dedicated civil contract, so Bristow is opening up bases over a three year period. Newquay, close to the south-west corner of the British Isles, and Prestwick in south-west Scotland, are both scheduled to start operations under Bristow on 1st January 2016. Newquay is effectively a replacement for the Royal Navy SAR coverage from Royal Naval Air Station Culdrose, just 35 miles away. 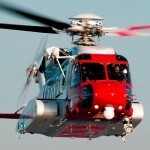 Two Sikorsky S92s will be based, with Bristow putting out a press release last month announcing the arrival of G-MCGY. The second will be G-MCGZ, the first offour additional S92s being brought in for the SAR contract while the AgustaWestland AW189 continues to suffer delays in the programme to get certification on the Full Ice Protection System. The Anglo-Italian manufacturer has one of their prototypes flying out in Alaska at present, aiming to complete all the necessary flying to cover all the remaining datapoints needed for EASA.